With the new Adidas headquarters, querkraft sunk a black crystal into the earth. 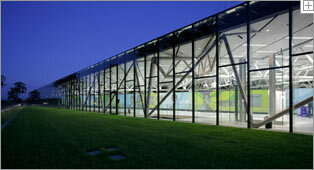 The 5000 m² hall has a simple structure – it is in principle the idea of a box inside a box. The inner box is made of pre-fabricated concrete; the outer box is a glass and steel skin. Both systems are structurally separated. The glass facade with its VARIO system using PARSOL grey glass gives the building its simple elegance which matches the corporate identity of the Adidas brand. The cleverly staged arena at the heart of the center gives the impression of a miniature stadium and acts as a synonym for a permanent and continuously developing show of performance sports whilst also being a platform for the presentation of the Adidas brand.